Is this physical body my true form? 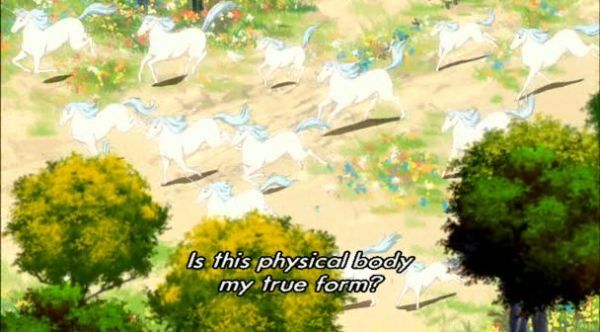 Well, probably more so than a unicorn (your unicorn may vary), but it is not the only body. In a manner of speaking. So, as I try to say, you can verify this by observing yourself. Or you can just take it on my stubbly face value, because I am going on to the next point. Follow if you dare. Â For I venture into the land of sleep. I said Saturday that dreams are the realm of the subtle body, or at least so say the sages. Â The subtle body (or “energy” body) is conscious in your dreams, but you are not conscious of being conscious. Â Not very much, at least. Â You may still be able to remember fractions of your dreams, if you take the time and strive to memorize them and put them into words before they disappear. It is possible to have one’s waking consciousness while dreaming. This is called “lucid dreaming”. Â This is largely a matter of training (doing reality checks at set points in waking life until you start doing them in your dreams), although it may also become inevitable given enough meditation or similar practices. Â However, the lucid dreaming that comes from technique is often used for wish fulfillment, whereas the lucidity that follows from meditation is a passive observation. This passive observation even takes place in the deep, dreamless sleep. Â This sleep is said to be the domain of the “causal body”, which we may also call spirit body. Â The individual human spirit (or spirit-soul, as opposed to the mind-soul usually studied in psychology) is the lowest level of us that can be differentiated from the Divine, as far as I know. Even if you are a goddamning atheist, you still spend some time in deep, dreamless sleep. Â Unless you are old, you do so each night, although the time spent in such slow-wave sleep is fairly short in adults and keeps shrinking with age. This is the deepest, most restful sleep, but strangely it is also when sleepwalking and night terrors (not nightmares, just a formless fear) occur. Â In this deep dreamless sleep there is still a kind of knowledge, a faint awareness. Awareness not of name or person, and not of memories of the past. In a sense you can think of meditation as exercising this “causal body”. As you make progress in this, after some years (decades usually) you start to have a witnessing awareness at all times. Â This witnessing awareness is the nature of the causal body. Â Usually it is so faint that you don’t really notice it in everyday life, except as a fundamental notion that you are the same person even though your body has exchanged nearly all of its atoms, even though your hopes and dreams have changed, even though your loves and hates have changed, even though your political affiliations have changed, even though your religion has changed. Â You are still there, observing all that happens, quietly, silently. This internal “I am” is the most we usually notice of the causal body, but in its field of consciousness all phenomena arise and pass. As the connection, or identification, with the causal body grows stronger through meditation or other spiritual practices, you may start to experience the same kind of awareness during deep sleep. Â I don’t do that, though it happened once by accident. Only a few people have come that far, and they tend to not sleep a lot anymore anyway, as they don’t need it that much. As I have mentioned, I usually spend some time in delta brainwave entrainment in the morning. Â (Delta waves are the slow waves associated with dreamless sleep.) I am for the most part not conscious during that time, although that is what it was originally meant for. Â I guess I am just lazy. I use it to induce dreamless sleep in the morning, when such sleep does not occur naturally. Â It only happens at the very beginning of the night naturally. But even though I am not awake, I am sometimes present to the degree that if dream fragments arise – pictures or drifting thoughts – I turn them away and go back to the silence. Â This is a practice of meditation, where we do just that, detach from images and thoughts. To myself I call this “meditative sleep”. I am not sure if it can happen without entrainment, but I mention it for context. I hope this was of a little interest. Â I suppose I may also mention that according to the Japanese religion “Happy Science”, when you die you wear an “astral body” that looks and feels like the one you used to have. But after some weeks, it has become more idealized. Â If you died from wounds, they will heal; if you died from old age, you will grow younger, and you will start wearing your favorite color. Â But when you move on upward, you lay off the astral body as well, and ascend in just your soul. Â So at the 6th dimension for instance, that is what you wear. Â You are still humanoid, but your appearance is more up to you, based on your thoughts rather than just habit. Â And a couple more dimensions up, you lay off even that and spend your time as merely rays of sentient energy. Â Or that’s what they say. I don’t know anything for sure about the afterlife myself. Â But if we instead look at it as if we look inward in ourselves, it seems pretty reasonable. Â First you have your habitual mind, which identifies with your body. Â Deeper down you have the spirit-soul, the deeper individual. Â And finally you have the actual spirit, which is not really human in the sense that our body is. Â It is more like… well, to quote the Bible, “The spirit of a human is a Lamp of the Lord.” Â In other words, it is a light source that gets its light from the Light itself. Now, the spirit is not easily observed. Â But through simple scientific meditation you can pick up the rest of the “bodies” fairly easily and within reasonable time. It is not some kind of fable. Â It can be verified by anyone who bothers to take the time and keep at it for a while. Â We can certainly discuss the wisdom of referring to these layers as “bodies”; I am not too comfortable with it myself, but I am a bit short of good expressions in any European language to describe them, so for now I’m sticking with it. This entry was posted in human mind and tagged sleep by itlandm. Bookmark the permalink. What is this delta wave entrainment? Does it really induce sleep? I have trouble sleepig at night. Brainwave entrainment is the use of sound or light pulses to cause brain waves of a certain frequency. For instance if you send 10 pulses per second, the brain will gradually start producing 10Hz waves. There are several such techniques. I use LifeFlow, a product that is made to be used with meditation. However, most of the frequencies are such as are also produced by the brain while sleeping. Delta especially is never dominant in waking mode, so it is very easy to fall asleep when it plays. That is not what it is made for, but I have found it useful. I used to be way too tired in the mornings before. I guess I still am if I go to sleep late, but at least I can sleep more efficiently now. Even if you don’t sleep, the brain will anyway be able to relax since it is synchronized in slow waves. You can also make your own entrainment tracks with free software, but I kind of like this one and I can afford it. Could you point to a YouTube of the music your are using? It is not really music, even though there are various soundscapes to mask the actual beats. I don’t think there is any of it on YouTube, at least not of LifeFlow that I use.